Maybe they’re not as flashy as ecommerce sites or omnichannel developments, yet brick-and-mortar wholesale clubs have led a quiet revolution in retail. An argument could be made—in fact, The Washington Post made it—that warehouse clubs like Costco, Sam’s Club, and BJ’s have done more to transform retail in recent decades than even Amazon or other actors on the ecommerce stage. U.S.-based ecommerce (and catalog) sales grew from $35 billion in 1992 to $348 billion in 2013. In the same stretch, wholesale clubs scaled the heights from $40 to $420 billion. Between 2000-2013, Costco’s sales grew by a whopping $50 billion, or $12 billion more than Amazon during the same span. For 2012, retail sales of the four largest wholesale clubs exceeded all ecommerce sales by 50%. 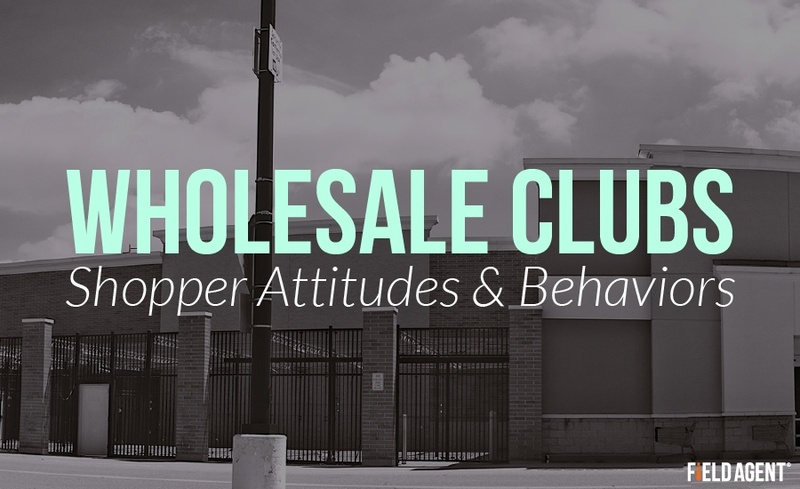 What Are Shopper Attitudes, Behaviors toward Warehouse Clubs? Considering their enormous impact on the U.S. retail scene, this weekend Field Agent explored shopper attitudes and behaviors toward wholesale clubs. Ultimately we surveyed 500 consumers, split evenly between men and women, from across the country. The sample consisted exclusively of wholesale club shoppers, of whom 68% said they shop at Sam’s Club, 52% at Costco, and 17% at BJ’s. As the images and video suggest, we also dispatched several of our Agents to Costco, Sam’s Club, and BJ’s to take pictures and share their thoughts about shopping at wholesale clubs. 1. What packaged goods do shoppers purchase from wholesale clubs? 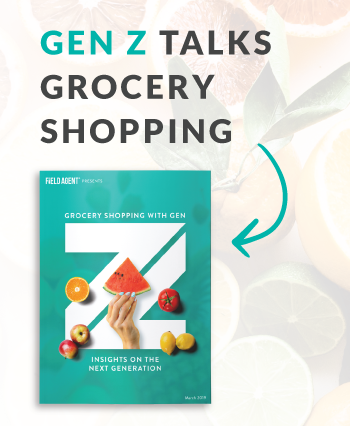 In our survey, 77% of respondents said they at least occasionally purchase frozen foods, good enough to claim the title of most commonly-purchased packaged good at wholesale clubs. 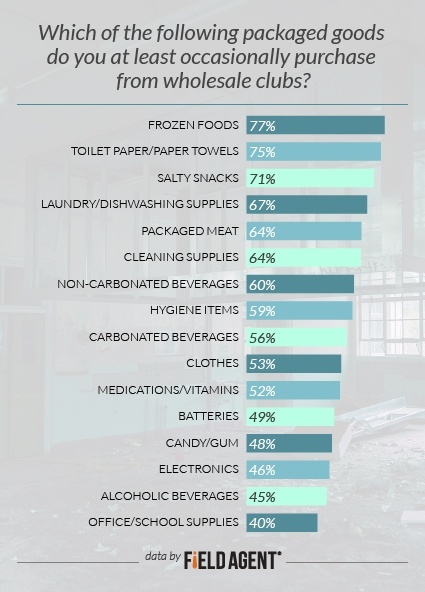 Rounding out the top 5 were toilet paper/paper towels (75%), salty snacks (71%), laundry/dishwashing supplies (67%), and packaged meat (64%; e.g., lunch meat/frozen chicken; not including freshly cut meat from deli/butcher). 2. How many shop fresh produce, meats, etc. at wholesale clubs? For many in our survey, wholesale clubs are a go-to destination for fresh groceries. Seventy-three percent purchase fresh produce at wholesale clubs, the most commonly purchased fresh food in our survey. 3. How important is organic produce to wholesale club shoppers? According to reports, Costco is now the largest organic grocer in the country, and Sam’s Club is steadily increasing its stock of organic offerings. But how important is organic to warehouse club shoppers? 4. What beverages are tops among warehouse club shoppers? Purchases of non-carbonated, non-alcoholic beverages like milk, tea, and juice (60%) were more prevalent among shoppers in our survey than non-alcoholic carbonated beverages (56%; e.g., soda) or alcoholic beverages (45%). 5. Are there product categories shoppers simply will NOT purchase from wholesale clubs? In other words, are shoppers apprehensive to buy certain categories from wholesale clubs because they perceive them inferior to other stores' offerings? We asked our sample to identify product categories they would never purchase from wholesale clubs. With the exception of tobacco products, there wasn’t a single category which more than 20% of shoppers said they never purchase from wholesale clubs. 6. What percentage of warehouse club shoppers say they purchase private label brands? Fully 3 of 4 shoppers (75%) in our study said they purchase private label brands (e.g., Kirkland, Member’s Mark) from warehouse clubs. 7. What do shoppers particularly like about wholesale clubs? They’re most keen, they told us, on the everyday, regular prices. Eighty-seven percent said it’s something they particularly like about wholesale clubs. Sales/price promotions (65%), samples/demos (64%), and package size/quantity (61%) were also major fan faves. 8. And what do shoppers particularly DISLIKE about wholesale clubs? Two things caught our attention. A little more than half (51%) said they’re not pleased with the crowds of other shoppers, and 39% said they don’t like the checkout processes/lines at wholesale clubs. 9. Just how satisfied are shoppers with wholesale clubs? Field Agent asked all 500 shoppers to assess wholesale clubs, generally speaking, on five different characteristics: customer service, store environment, prices, quality of merchandise, and assortment of merchandise. As the table below displays, shoppers are mostly satisfied with the wholesale scene. Perhaps most surprisingly, quality of merchandise (90%) eclipsed all other characteristics—even prices—in percentage of “extremely” and “very” satisfied responses. 10. What percentage of warehouse club shoppers have purchased merchandise through a club’s website for home package delivery? Are they popular among warehouse club shoppers for buying merchandise? Only 22% in our study said they’ve purchased items from a warehouse club’s website for home package delivery. 11. And what about buying online for in-store or curbside pickup? Even fewer shoppers, just 18%, say they’ve purchased merchandise online for in-store or curbside pickup at a wholesale club. 12. What proportion of wholesale club shoppers have downloaded and used a club’s smartphone app? Among respondents, all of whom took this survey by way of the Field Agent mobile app, 37% reported downloading and using a wholesale club’s smartphone app. 13. How many shoppers in the sample have patronized online-only wholesale clubs like Boxed or Jet? Eight respondents, or 2%, said they shop with online-only wholesale club Boxed.com, while four (1%) said they use Jet.com’s wholesale store. 14. But how much potential do online-only wholesale clubs have with shoppers? After explaining the concept, including no membership fees, we asked respondents how appealing they find online-only wholesale clubs like Boxed and Jet. In all, 41% find the idea either “extremely” or “very” appealing, and only 10% said it’s “not at all appealing” to them. 15. What improvements would wholesale club shoppers suggest? Only 8%, approximately, recommended eliminating or lowering membership fees. Mobile Audits and Research can take you inside practically anywhere, including thousands of wholesale clubs across the country. When you need “eyes and ears” inside Costco, Sam’s Club, or any other club, look to Mobile Audits and Research for fast, affordable access. Download our infographic, “Mobile Audits and Research: Bridging the Knowledge Gap,” to learn more about these capabilities. Report: What Do Shoppers Think about Walmart’s Superstore of the Future?